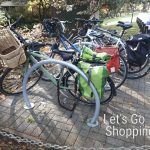 This is a tale that started about six months ago when I was bemoaning once again the lack of bike parking on the Worcester Blvd side of the City Council building. I’m a fairly regular visitor there and, while there is some visitor parking on the Hereford St side (although often never enough it seems…), it’s always grated that on the other side I’d have to attach myself to a lamp-post or sometimes nothing (this is one reason why it’s handy to have a kick-stand). 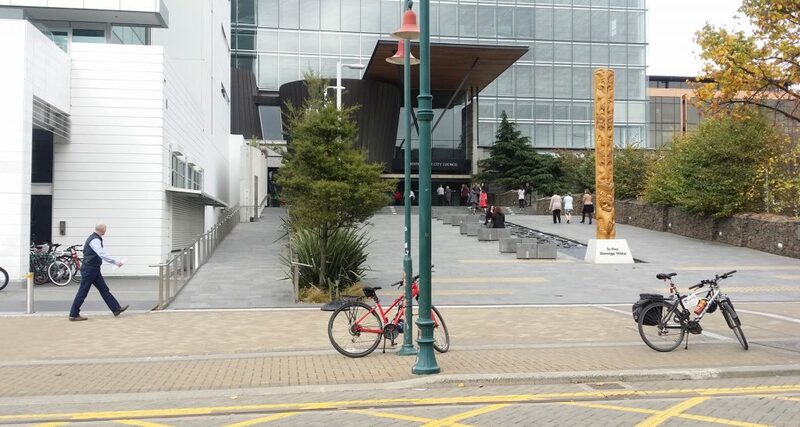 The nearest bike parking in front of the adjacent HSBC building was invariably full too. Somewhere new for the bike to go! A simple enough treatment, using spare space in between the other street furniture. So kudos to Council (and anyone directly involved) for making this happen; my potentially whingey post can now turn into a grateful one. Things like this can seem relatively unimportant, especially when Council is spending tens of millions a year on new cycleways. But every bike journey has to start and end somewhere, and in many cases that’s not in a nice bikeshed at work, study or home. New street rebuilds around the city are slowly adding to the bike parking stock, so hopefully you will find a suitable stand at the end of your next journey. If not, why not mention it to the adjacent businesses and/or City Council? Have you used the new CCC bike parking? What about new parking elsewhere? It’s a great move, well done CCC – now put in about 50 more… thanks. If you’re curious about where other spots ate. I made a google map from CCC data. I’m sorry but i still think this is the minimum they could begrudgingly do. The parks have no shelter. There is basically only 4 parks and then it becomes a problem again to lock a bike. There is no signage pointing to further (closest) parking for bikes if these are full. They could also add signage to inform where the lockable bike parking is but never seem interested to do this. Meanwhile – on another part of the city – the CCC wants to spend over $1Mil for car parking??? 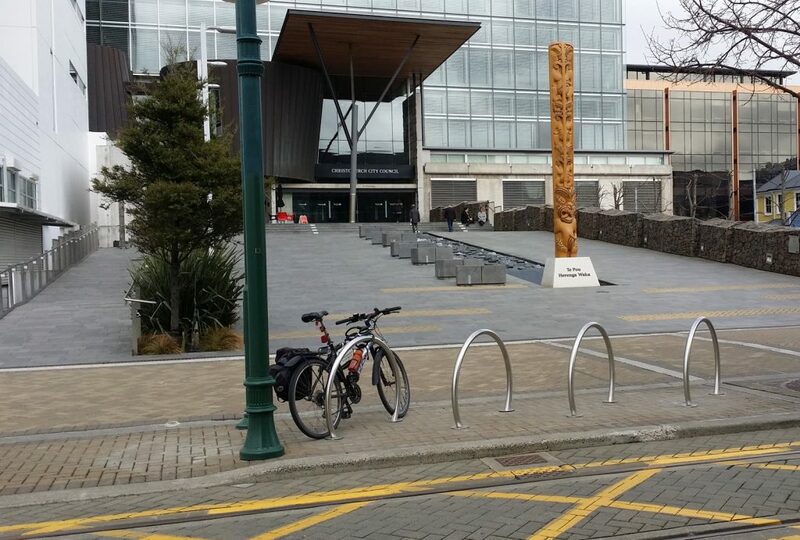 Small things do matter and it is great to see our city becoming more and more cycle friendly…. I had my locked up bike stolen yesterday from the bike room in the bus interchange. This has left me wondering are there any safe places to leave a bike in the CBD. I would prefer to cycle to work but have seen bikes taken within minutes of being locked up on the street. Are there any recommendations for a safe place to leave my bike? A lot of bikes have apparently been stolen recently from that bike room (bit of a failure for a $53 million facility). CCTV was eventually checked by police but they couldn’t identify the person from it. My work doesn’t allow bikes inside (no room). Yeah I will definitely get a better bike lock but i’m not to keen on leaving it in the bus exchange again.